Dinosaur Valley State Park sits astride the scenic Paluxy River, a tributary of the Brazos River. During the summer months, the Paluxy normally stops flowing, leaving only isolated pools. Many people come here to see the dinosaur tracks in the riverbed, of course. But the hilly, hardscrabble limestone terrain is at the intersection of several ecoregions, so you will also see an interesting mix of plants and animals. Around 113 million years ago, this area was at the edge of an advancing and retreating sea. Calcium carbonate deposits from the shells of crustaceans (crabs, etc.) 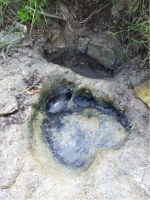 that lived in the sea formed a limey mud. That mud had the perfect consistency – not too wet, not too stiff – to preserve tracks. Herbivorous (plant-eating) dinosaurs came to browse the large tropical palm and conifer trees that grew inland from the shore. Carnivorous (meat-eating) dinosaurs came here for their prey: the plant-eaters. Occasionally, dinosaurs would cross the tidal flats, leaving tracks in the mud. Leap forward 113 million years, to a small boy exploring the Paluxy River in 1909. 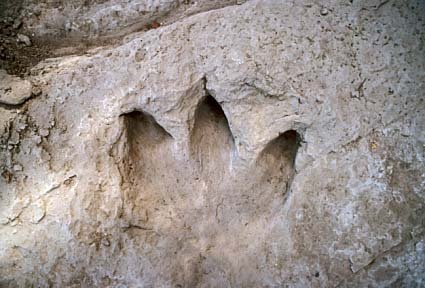 George Adams found strange three-toed tracks in the limestone bed of the river. A mighty flood in 1908 may have uncovered the theropod tracks. These were the first distinct sauropod tracks ever found. For the first time, scientists could see that sauropods walked on all four legs, rather than relying on water to support their weight. The tracks gave scientists valuable evidence of dinosaur habits and activities. Acrocanthosaurus: The theropod tracks were most likely left by the carnivorous Acrocanthosaurus, a smaller relative of Tyrannosaurus rex. This dinosaur chased its prey on two legs, was 20 feet tall and 30 feet long, and weighed 3 to 5 tons! Sauroposeidon proteles: For many years, scientists thought the brachiosaur Pleurocoelus made the sauropod tracks. But new bones found nearby in 1996 changed their minds. Graduate student Peter Rose determined the bones were of a new species of dinosaur that he named Paluxysaurus jonesi in 2007. Even more recently, scientists have determined that the sauropod tracks belonged to the Sauroposeidon proteles. Whatever its name, it was big! The sauropod was 70 feet long and 13 feet high at its hip, and it weighed 40 to 44 tons. It left hind footprints over a yard long, with smaller, clawless horseshoe-shaped front footprints. Mammals seen in the park include white-tailed deer, coyotes, bobcats, raccoons, beavers, skunks, opossums, armadillos, fox squirrels, rabbits and small rodents. Several kinds of lizards and snakes live here. Yellow and channel catfish, striped and largemouth bass, alligator gar, freshwater drum and bluegill swim in the Paluxy River. Birders can see many species of both resident and migrant birds, including wild turkeys, golden-cheeked warblers and black-capped vireos. Golden-cheeked Warbler: Endangered golden-cheeked warblers nest only in the mixed Ashe juniper and oak woodlands of Central Texas. They nest from March to July, and spend winter in Mexico and Central America. Warblers eat insects and spiders from oaks, and use long strips of cedar bark and spiderwebs to build nests, where they lay three to four eggs. 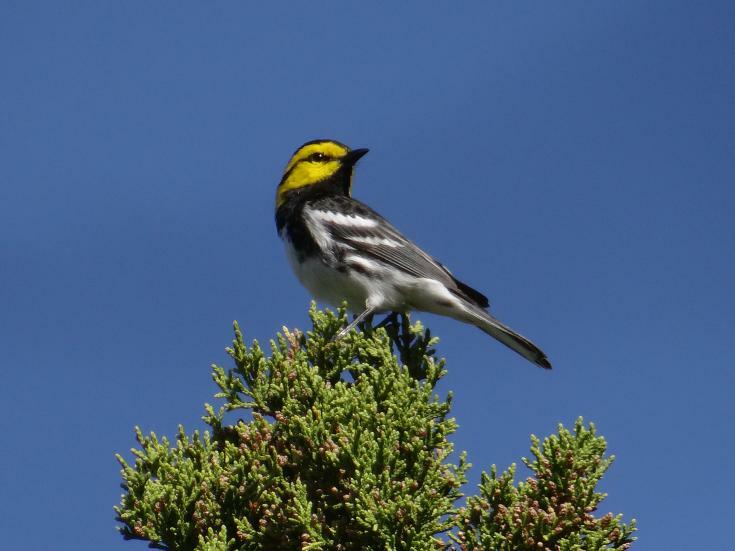 Loss of nesting habitat has reduced golden cheeked warbler populations. 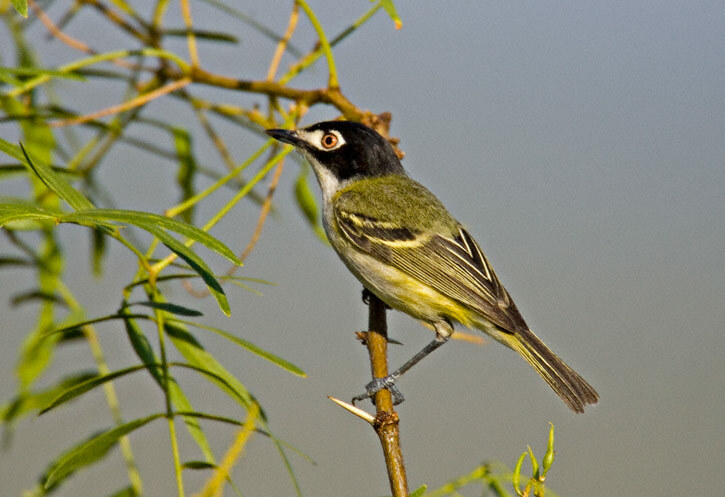 Black-capped Vireo: Black-capped vireos also nest in Texas in the spring (April to July) and spend winter on the west coast of Mexico. These tiny birds nest in low-growing shrubs and return each year to the same nesting area. Males sing to attract mates and to defend two- to four-acre territories. The loss of low-growing shrub habitat (due to grazing, clearing and fire suppression) has led to this bird’s scarcity. It was removed from the endangered species list in 2018. Just for kids: Vanishing! Why are some animals disappearing? 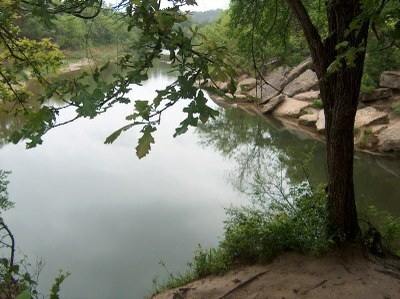 Plants of the Cross Timbers and Prairie areas thrive in the river basin. American elm, cedar elm, Texas sugarberry, bur oak and green ash grow in the bottomlands. In well-watered zones, you will see pecan, walnut, cottonwood, sycamore and black willow, as well as several kinds of shrubs and vines. Many plants of the Edwards Plateau grow in the upland areas of the park. These include Ashe juniper, live oak, Texas red oak and Texas ash, with some post oak and mesquite, along with various grasses and shrubs.